Monday night: Mostly clear. Still comfortable. Mid and upper 60s. Tuesday: Hotter. Bit more humid. Low 90s. Wednesday: Mostly cloudy. A passing shower. Mid and upper 70s. 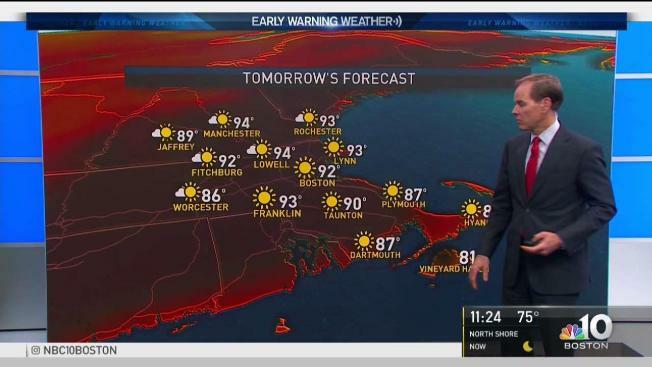 It’s a rarity that New England sees temperatures around 90 degrees from north to south without much in the way of humidity, but today is one of those exceptional days. A southwest wind will team with plentiful sunshine to boost temperatures quickly, staving off a sea breeze at the coast. But deep humidity is still far to the south of New England. Dry air tends to cool effectively at night, so we can expect another comfortable night for sleeping Monday before more sunshine and a continued southwest wind bump temperatures back around and over 90 on Tuesday. The difference between Monday and Tuesday’s weather is a cold front marching into New England from Canada on Tuesday. It's an important player in our weather for a few reasons: the cold front sparks scattered showers Tuesday afternoon and evening from north to south, respectively, the front sweeps cooler air into the region behind it for Wednesday and, finally, the front catches a hurricane and flings it out to sea, away from New England. The hurricane will be what is now Tropical Storm Chris, off the Carolina coast, and an offshore pass means the only direct impact expected on New England are building waves and surf Wednesday through Thursday. Such waves will create strong rip currents at our beaches during that same timeframe, making the first half of the week the friendlier half to wade. By the weekend, the waves will be gone and warmth will be rebuilding across our region, eventually bringing temperatures back into the 90s with increased humidity by early next week in our exclusive Early Warning Weather 10-day forecast.